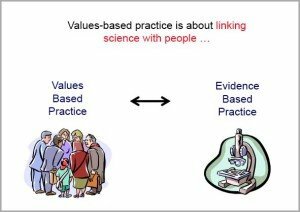 Why is Values-based Practice in Surgical Care Important? In most clinical situations there is more than one evidence-based option available. Shared decision-making means clinician and patient deciding together which option is best where ‘best’ means from the perspective of that particular patient’s individual values. 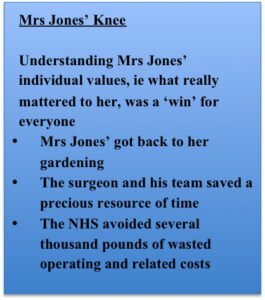 For the full story of Mrs Jones and the decision about whether to do a knee replacement or opt for conservative management see ‘To operate or not to operate?’ in What is Values-based Practice in Surgical Care? 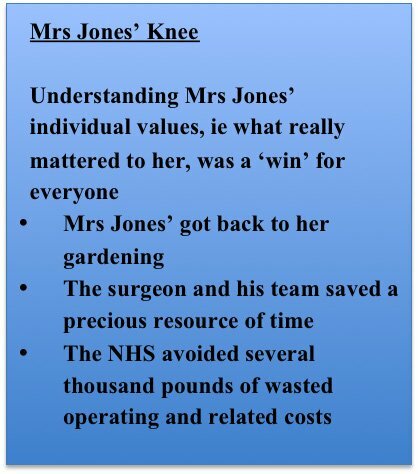 Most people in Mrs Jones’ situation would have wanted knee replacement. But for Mrs Jones, given what mattered to her (to be able to garden again), this would have made a bad situation worse (by further reducing her mobility). In a decision shared with the surgeon Mrs Jones opted for conservative treatment. Shared decision-making based on values thus improves clinical outcomes in a time- and cost-effective way. This is why it has been emphasised for some time in evidence-based guidelines and codes of practice. It is also why, following the 2015 Montgomery judgment, it is now the legal basis of consent in the UK. Reference: Sackett, D.L. Straus, S.E., Scott Richardson, W., Rosenberg, W., and Haynes, R.B. 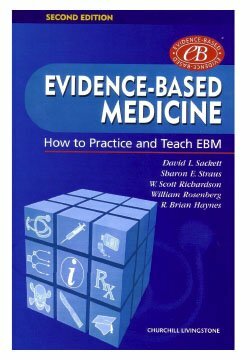 (2000) Evidence-Based Medicine: How to Practice and Teach EBM (2nd Edition). Edinburgh and London: Churchill Livingstone. 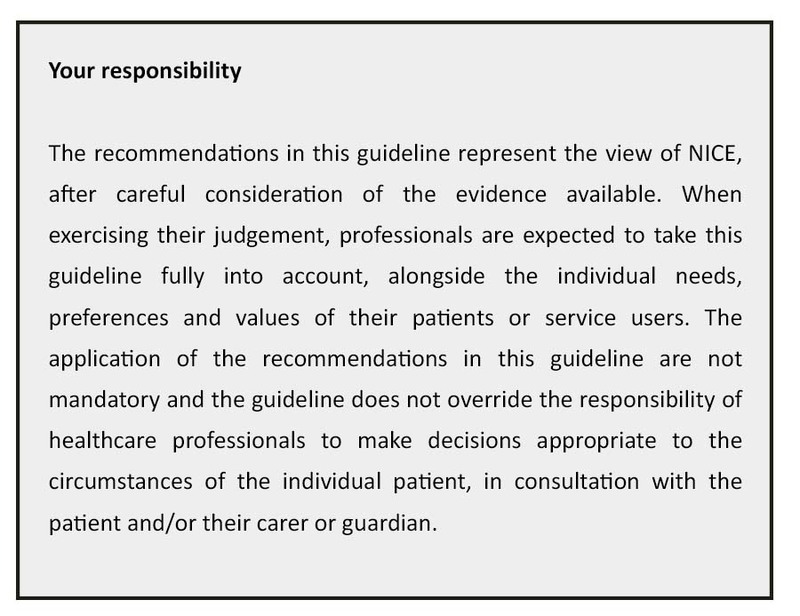 The importance of patients’ individual values in shared decision-making has been marked by a recent Supreme Court decision on consent, the (2015) ‘Montgomery judgement’. Exactly how the Montgomery judgement will be interpreted in different contexts remains to be seen. But the bottom line is that ‘Montgomery consent’ is based on patients’ individual values being taken into account in clinical decision-making.